“The Buddha was magnificent. He clearly stated that women could achieve dharma, as well as enlightenment in the same way as men. The Buddha did not only challenge the caste system but also the capacity of human, which created opportunity for women to practice the dharma systematically,” said Dhammananda Bhikkuni from Songdhammakalyani Monastery, a former associate professor from Thammasat University, Associate Professor Dr. Chatsumarn Kabilsingh or “Luang Mae”. She pioneered the path of Bhikkuni in Thailand, completing the 4 assemblies of the Buddhist community. Her Buddhist path started in 2001 when she took her “samaneri” ordination named “Dhammananda.” She was the first Thai woman to be ordained in a Theravada monastic lineage. Than, she received full monastic ordination as a Bhikkhuni in the Theravada tradition in Sri Lanka, 2003. In terms of education, Luang Mae graduated Ph.D. in Buddhism from Magadh University in India. She is considered the first Thai woman who graduated Ph.D. in Buddhism. She is a well-known religious scholar, especially at an international level regarding the issue of women’s participation in ordination. The topic of her Ph.D. thesis discusses about “a comparative study of Patimokkha Rules for Bhikkuni in 6 sects,” which guarantees that at least she is one of the people who are well informed about Bhikkuni. Her knowledge is deeply rooted, in terms of Theravada Buddhism as well as other sects. From the beginning, academic strength has helped her overcome the challenge of becoming Bhikkuni through ordination. This leads to the understanding in personal rights and responsibilities. As a result, she is able to protect women’s rights and responsibilities on the Bhikkuni road with stability. In 2014, after over 12 years of ordination, “Luang Mae” was appointed by Mahintawangsa, the patriarch from Sri Lanka, among both Sanghas “Pawattini” or the first female preceptor of Thailand. 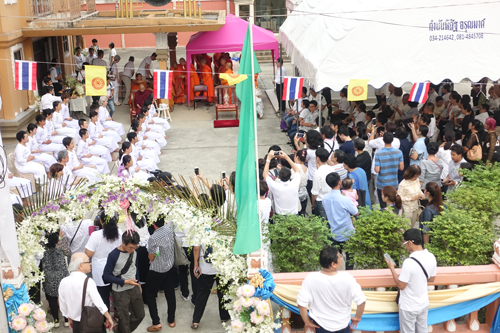 Until today “Long Mae” still focuses on building quality and knowledge for Theravada Bhikkhuni in Thailand, as well as establishing a network of Bhikkhuni and Bhikku in Asia. In addition, Thailand is still part of the convention on the elimination of all forms of discrimination against women. It is the agreement, which involves promoting gender equality, eliminating rules, laws, traditions, customs, and values that appear to discriminate women. Thailand has also joined the international convention on civil and political rights since 1996. Thus, Thailand must protect the fundamental rights of every citizen, meaning people possess freedom of thought, conscience, and religion. If these rights are violated, the freedom of choosing or having religion will no longer be available. Similarly, the freedom of expressing the religious practices or personal beliefs may be restricted by particular conditions enforced by the law to maintain safety, peace, hygiene, or morality, or only to protect the fundamental rights and freedom of others.